Having passed by the mountain so many times, it was with much anticipation that I set forth along the wooded glen of River Kirkaig to start the ascent of Suilven. 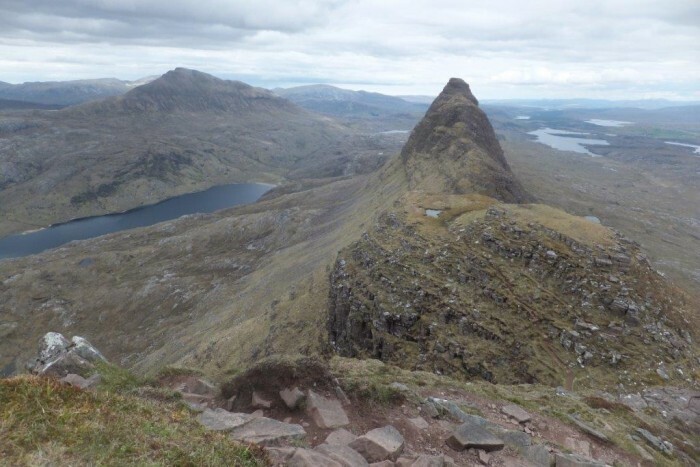 After my scramble up An Teallach, Suilven was another mountain of dreams and one that I had longed to climb. It was a long walk in to the base, approximately seven miles, the first section up and alongside the falls of Kirkaig was wonderful with the wild flowers of spring and early summer in abundance, especially the orchids. 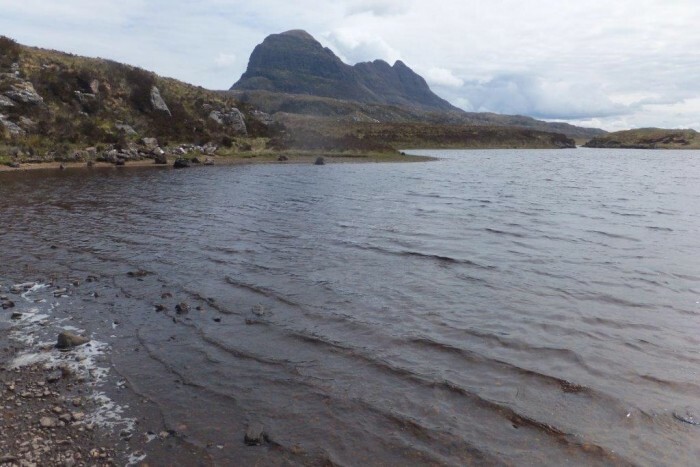 Then a long walk around Loch Fionn to the base of Suilven . The climb up to the summit was hard and steep with a lot of loose scree and boulder. The walk up the scree lay at the centre of the two peaks: Meall Beag to the east and Caisteal LIath to the North West. On reaching the central point I turned for the first time to look back on the mountains and terrain of Assynt. What an amazing sight I saw of the valley floor with lochans everywhere and then the spectacular shapes of Stack Polly , Cull Beagh then An Teallach further South. It was even clear enough to see the mountains of Arran and the Outer Hebrides. Suilven rises from a base of Lewisian Gneiss as a sandstone peak. A peak that lay above the ice sheets of the Ice Age and looking down onto the scene you can almost imagine how it was formed over millions of years. 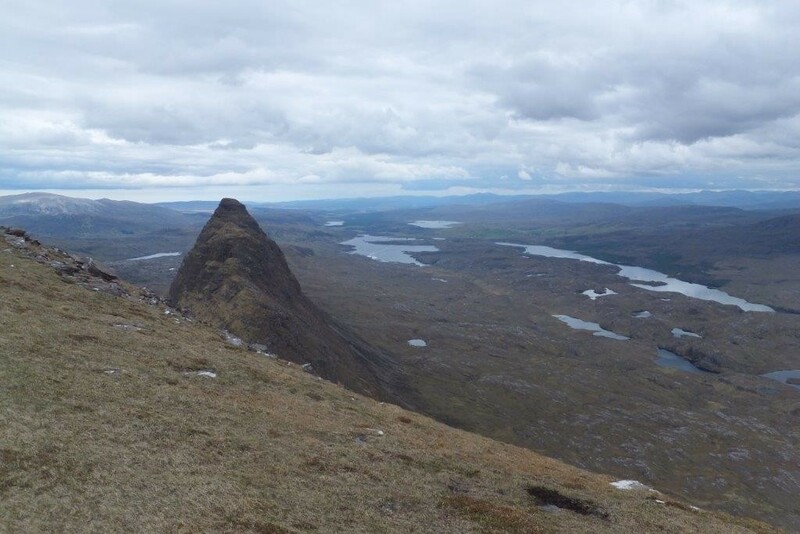 It was a gradual climb along the ridge to the North West summit of Suilven and from the summit I saw a staggering view of the Sutherland peaks to the North and across to the Summer Isles. The walk off was steep and long, back along the same track but there was a rewarding warm sun to cheer the soul after a cloudy and cool walk up. The sun on the gorse gave off the most fragrant scent. It was a lovely end to the walk with the River Kirkaig cascading to the left. Then to round a good day off the most remote book shop in Scotland with its shop and café was the place to be for a well earned rest .